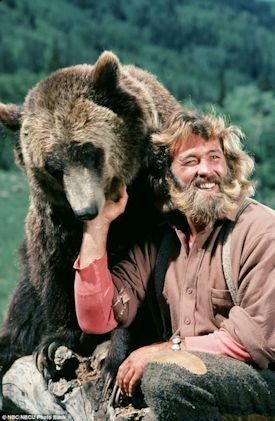 getTV expands its popular Sunday Westerns posse, as the beloved 1977 adventure series The Life and Times of Grizzly Adams moves into the weekly 9 a.m. ET slot with a Super Bowl Sunday marathon on February 5, while the rare 1966 David Carradine Western Shane takes over at 10 a.m. ET starting February 12. In addition to these two classic series, the network will air the 1984 action series Blue Thunder in a special Get Lost In TV nine-episode marathon on Sunday, February 26, starting at 10 p.m. ET. For the week of Feb. 6-10, 2017, we have many current sitcom stars and past sitcom stars on TV talk shows! All times listed are Eastern. So get your DVRs (or whatever you use) ready! Ready? Here is all what you need to know for the coming week! Joe Jonas (Jonas L.A.) - Watch Joe on The Tonight Show Starring Jimmy Fallon at 11:34pm on NBC. Tracee Ellis Ross (black-ish/Girlfriends) - Tracee visits Late Night with Seth Meyers at 12:36am on NBC. She will also be on LIVE! with Kelly, so check your listings. Jennifer Lawrence (The Bill Engvall Show) - Jennifer is a guest on The Late Late Show with James Corden at 12:37am on CBS. T.J. Miller (Silicon Valley/The Goodwin Games/Carpoolers) - T.J. appears on a repeat of The Late Late Show with James Corden at 12:37am on CBS. Johnny Galecki (The Big Bang Theory/Roseanne) - Johnny drops by Last Call with Carson Daly at 1:35am on NBC. Ron Funches (Powerless/Undateable), Danny Pudi (Powerless/Community) and Alan Tudyk (Powerless/Suburgatory) - Ron, Danny and Alan are guests on @midnight on Comedy Central at midnight. Sofia Vergara (Modern Family/The Knights of Prosperity/Hot Properties) - Sofia stops by The Ellen DeGeneres Show, so check your local listings. Keke Palmer (Scream Queens/True Jackson, VP) - Keke appears on Harry, so check your local listings. Eugene Levy, Dan Levy, Catherine O'Hara and Annie Murphy (Schitt's Creek) - The cast discusses the show on the AOL Build Show at 1:30pm. Dan and Annie will also be on New York Live on WNBC in New York at 11:30am ET. Rebe McEntire (Reba/Malibu Country) - Reba performs on NBC's Today sometime between 7-9am and in the 10am hour. She will also be on Access Hollywood Live (check your local listings) and New York Live on WNBC in New York at 11:30am ET. Ernie Hudson (Grace and Frankie/The Last Precinct) - Ernie drops by Home & Family on Hallmark Channel at 10am ET/PT. Sarah Michelle Gellar (The Crazy Ones) - Sarah chats with the ladies of The View on ABC at 11am ET/10am CT-PT. Will Arnett (Arrested Development/Up All Night/Running Wilde) - Catch Will on Jimmy Kimmel Live! at 11:35pm on ABC. Reba McEntire (Reba/Malibu Country) - Reba stops by Late Night with Seth Meyers at 12:36am on NBC. She will also be on the AOL Build Show at 3:30pm. Jamie Foxx (The Jamie Foxx Show) - Jamie appears on a repeat of The Late Late Show with James Corden at 12:37am on CBS. Josh McDermitt (Retired at 35) - Josh is a guest on @midnight on Comedy Central at midnight. Seth Morris (Parks and Recreation/Go On/Happy Endings) - Seth appears on @midnight on Comedy Central at midnight. JB Smoove (The Millers/Curb Your Enthusiasm/'Til Death) - JB is a guest on Conan at 11pm on TBS. Sean Giambrone (The Goldbergs) - Sean appears on Conan at 11pm on TBS. Tracy Morgan (30 Rock/The Tracy Morgan Show) - Tracy visits The Ellen DeGeneres Show, so check your local listings. Vanessa Hudgens (Powerless) - Vanessa stops by The Ellen DeGeneres Show, so check your local listings. Laurence Fishburne (black-ish) - Laurence is a guest on Harry, so check your local listings. Lauren Ash (Superstore) - Lauren appears on Harry, so check your local listings. Eugene and Daniel Levy (Schitt's Creek) - Eugene and Daniel will be on NBC's Today in the 10am hour. Henry Winkler (Happy Days/Out of Practice/Arrested Development) - Henry joins the Chew Crew on ABC's The Chew at 1pm ET/12pm PT/CT. Connie Britton (Spin City/The Fighting Fitzgeralds/Lost at Home) - Connie is a guest on ABC's Good Morning America sometime between 7-9am. Sheryl Lee Ralph (Instant Mom/Moesha/It's a Living) - Sheryl appears on Access Hollywood Live, so check your local listings. Tracee Ellis Ross (black-ish/Girlfriends) - Tracee appears on The Wendy Williams Show at 2am on BET or on your local stations. Max Greenfield (New Girl/Modern Men) - Max is a guest on The Talk on CBS at 2pm ET/1pm CT-PT. Zach Galifianakis (Baskets) - Watch Zach on Jimmy Kimmel Live! at 11:35pm on ABC. Sean Hayes (Will & Grace/Sean Saves the World) - Sean visits Jimmy Kimmel Live! at 11:35pm on ABC. Neil Patrick Harris (How I Met Your Mother/Stark Raving Mad/Doogie Howser, M.D.) - Neil is a guest on a repeat of The Late Late Show with James Corden at 12:37am on CBS. Justin Kirk (Weeds/Animal Practice) - Justin appears on Last Call with Carson Daly at 1:35am on NBC. Anthony Anderson (black-ish/Guys with Kids/All About the Andersons) - Anthony stops by Conan at 11pm on TBS. Cristela Alonzo (Cristela) - Cristela appears on Conan at 11pm on TBS. Tracee Ellis Ross (black-ish/Girlfriends) - Tracee is a guest on Watch What Happens: Live at 11pm on Bravo. She will be on Comedy Central's The Daily Show with Trevor Noah at 11pm. She also chats with the ladies of The View on ABC at 11am ET/10am CT-PT. Paul Feig (Sabrina, the Teenage Witch/The Jackie Thomas Show) - Paul is a guest on @midnight on Comedy Central at midnight. Jesse Tyler Ferguson (Modern Family/The Class) - Jesse visits The Ellen DeGeneres Show, so check your local listings. Colin Hanks (Life in Pieces) - Colin appears on Harry, so check your local listings. Marcia Gay Harden (Trophy Wife) - Marcia is a guest on Rachael Ray and Access Hollywood Live, so check your local listings. Sutton Foster (Younger) - Sutton will be on The Wendy Williams Show at 2am on BET or on your local stations. She is a guest on New York Live on WNBC in New York at 11:30am ET. Reba McEntire (Reba/Malibu Country) - Reba guest co-hosts The View on ABC at 11am ET/10am CT-PT. Joanna Garcia Swisher (Reba/Better with You) - Joanna visits The Tonight Show Starring Jimmy Fallon at 11:34pm on NBC. She joins the Chew Crew on ABC's The Chew at 1pm ET/12pm PT/CT. Jim Parsons (The Big Bang Theory) - Jim appears on a repeat of The Late Late Show with James Corden at 12:37am on CBS. America Ferrera (Superstore) - America is a guest on a repeat of The Late Late Show with James Corden at 12:37am on CBS. Kat Dennings (2 Broke Girls/Raising Dad) - Kat stops by Conan at 11pm on TBS. Will Arnett (Arrested Development/Up All Night/Running Wilde) - Will appears on LIVE! with Kelly, so check your listings. He also discusses The Batman Lego Movie on the AOL Build Show at 12:30pm. Cheryl Hines (Son of Zorn/Suburgatory/Curb Your Enthusiasm) - Cheryl discusses Son of Zorn on the AOL Build Show at 4pm. Will Arnett (Arrested Development/Up All Night/Running Wilde) - Will is a guest on ABC's Good Morning America sometime between 7-9am. He appears on LIVE! with Kelly, so check your listings. He chats with the ladies of The View on ABC at 11am ET/10am CT-PT. Zosia Mamet (Girls) - Zosia talks about Girls on LIVE! with Kelly, so check your listings. Anthony Anderson (black-ish/Guys with Kids/All About the Andersons) - Anthony appears on The Real, so check your local listings. Adam Scott (Parks and Recreation) - Watch Adam on a repeat of Jimmy Kimmel Live! at 11:35pm on ABC. Lena Dunham (Girls) - Lena stops by The Tonight Show Starring Jimmy Fallon at 11:34pm on NBC. She visits NBC's Today sometime between 7-9am. She chats with the ladies of The View on ABC at 11am ET/10am CT-PT. She will also be on the AOL Build Show at 2:30pm. Will Arnett (Arrested Development/Up All Night/Running Wilde) - Will visits The Late Show with Stephen Colbert at 11:35pm on CBS. Dakota Johnson (Ben & Kate) - Dakota is a guest on a repeat of Late Night with Seth Meyers at 12:36am on NBC. Lily Tomlin (Grace and Frankie/Malibu Country) - Lily appears on a repeat of The Late Late Show with James Corden at 12:37am on CBS. Kathryn Hahn (Happyish/Transparent/Free Agents) - Kathryn is a guest on Harry, so check your local listings.